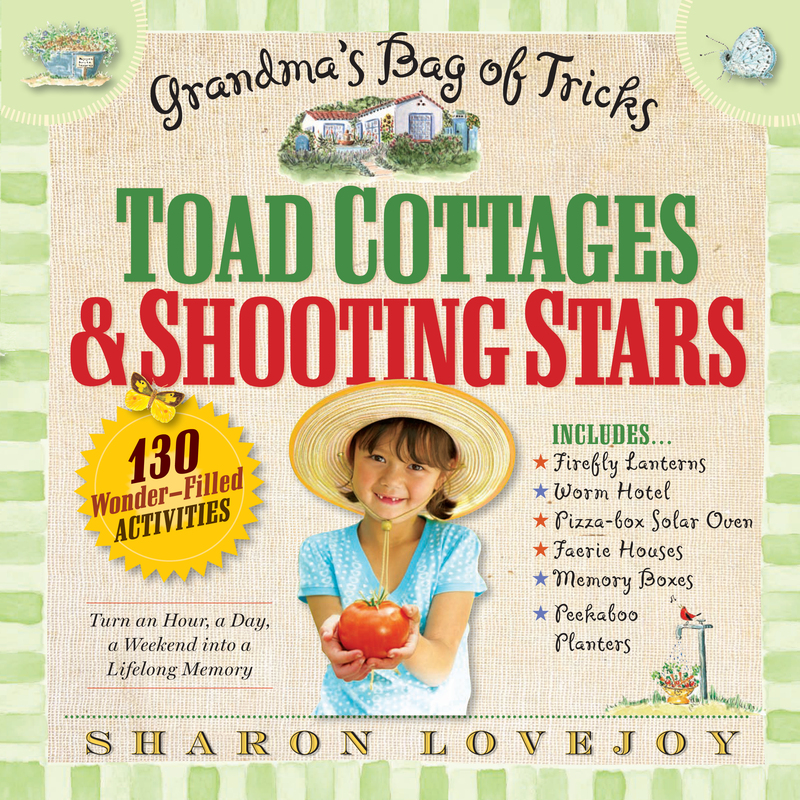 I recently picked up a gorgeous little book called Toad Cottages and Shooting Stars: Grandma’s Bag of Tricks, by Sharon Lovejoy. Don’t let the title put you off – you don’t need to be a grandmother, or even a woman for that matter, to find loads of great activities for you and your kids. One of the best aspects of the book is that it covers such a wide range of interests. It not only has fun activities to get your kids involved in nature, but it also covers gardening, recipes, crafts and games. The book is attractively laid out, overflowing with photos, sketches, and paintings. Check out the link above for a good look at the contents. 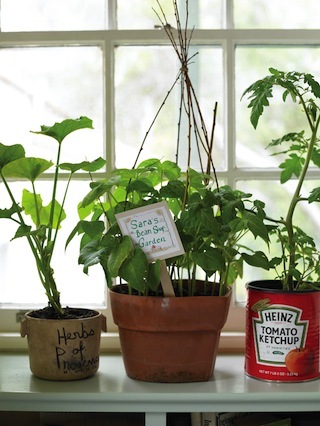 The idea is to take seeds, cuttings, old withered carrots, parsnips or beets that have languished too long in the vegetable drawer – in other words stuff generally destined for the compost heap – and give them a second life in re-used jars, cans, bottles, just about any type of container. You’re not looking to provision your winter larder here; you’re just experimenting with what will grow from stuff you’d normally throw away. Kids get a science project, a lesson in botany, the responsibility of watering and caring for plants, and a new way to look at old cans, containers, and kitchen waste. 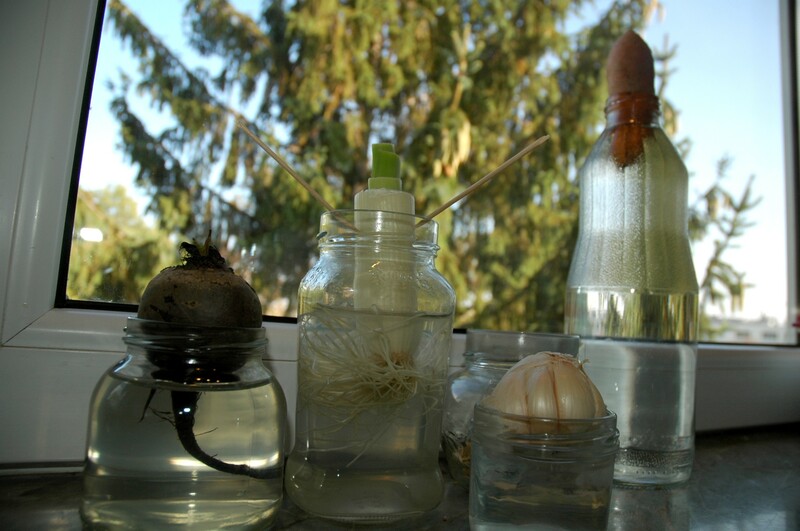 We started small, suspending a head of garlic, a sweet potato, the bottom of a leek, and a wrinkly beet in jars of water. It’s only been three days, but the garlic has already sent out hungry new roots, the leek’s roots have noticeably grown, and the beet has two tiny new leaves poking out from the top. Still waiting on signs of life from the sweet potato, but by all accounts once they start they grow like mad. We’ve also saved seeds from a pre-Halloween jack-o-lantern and an overgrown yellow squash from the garden to plant as soon as I pick up some potting soil. There are also three horse chestnuts (this time of year the kids come home just about every day with pockets bulging with ‘conkers’) that we’ve wrapped in a wet paper towel, placed in a Ziploc bag, and taped to the kitchen window. I’m not sure they’ll sprout, but the suspense is part of the fun of it. We’ll keep you posted. Next time: Growing peanuts, pineapples, and potatoes. Fun stuff and some great memories your kids will have with a pretty cool dad.